On display from September 21st to December 23rd, Merging Time: Vancouver Through the Lens is the City of Vancouver Archives’ latest collaborative effort with the Langara Professional Photo Imaging Department. In early 2011, students in Darren Bernaerdt’s Introduction to Photo Imaging class (Photo 1248) were given an assignment at the City of Vancouver Archives to find historical black and white photographs of Vancouver. Half of the students chose photographs between 1919 and 1948, and the other half selected ones before 1919. The majority of the photographs were taken when the buildings were only a few years old. Today, many of these buildings have heritage status. After studying all aspects of the photograph and pinpointing the exact location in which the original was taken, each student went back to the original site and recaptured the image with a traditional 4×5 view camera. The students had to work around the obstacles of current-day sidewalks and surrounding new buildings, but when viewed, these photographs are nearly identical in composition, perspective, angle and focal length to the originals. 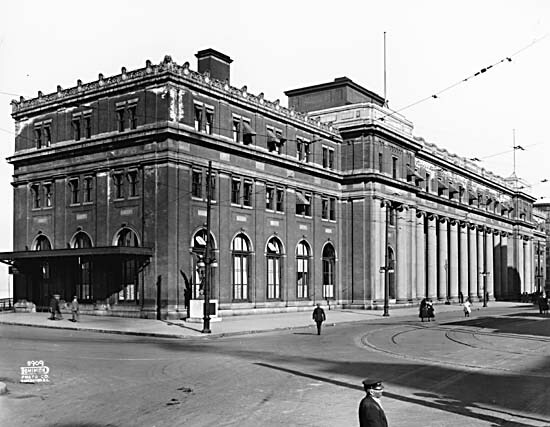 Waterfront Station - 601 West Cordova Street. Photo credit: Danielle Baker. 2011. Going beyond the basic side-by-side, now-and-then comparison, the students digitized their newly photographed 4×5 negatives using a high-resolution scanner. They resized the original and new photographs proportionately allowing for accurate masking and revealing of two eras. The blended tones create a wonderful seamless transition, highlighting the social, urban and industrial contrasts between the past and present. Simultaneously, the images depict two realities where parallels are more similar than different: thoroughfares remain thoroughfares, and the city’s grid remains unaltered. The final product is a temporal flux where two time periods are seen at once. The timing of this exhibit cannot be more appropriate. This past July, the City of Vancouver Archives launched its presence on Historypin, a website that invites users to ‘pin’ photographic content to geographic locations on Google Maps. These images are overlaid onto Google Streetview, creating an immediate comparison between old and new. The opacity of the overlaid images can be adjusted, blending “what was” with “what is”. The work created by the Langara 1248 class is a professional and artistic rendition of this concept. 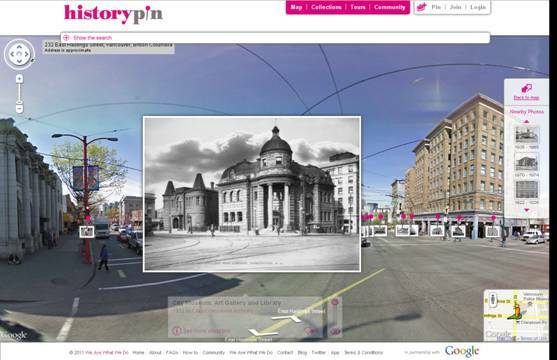 Historypin screenshot - Carnegie Library at Main and Hastings. 1932 / 2009. 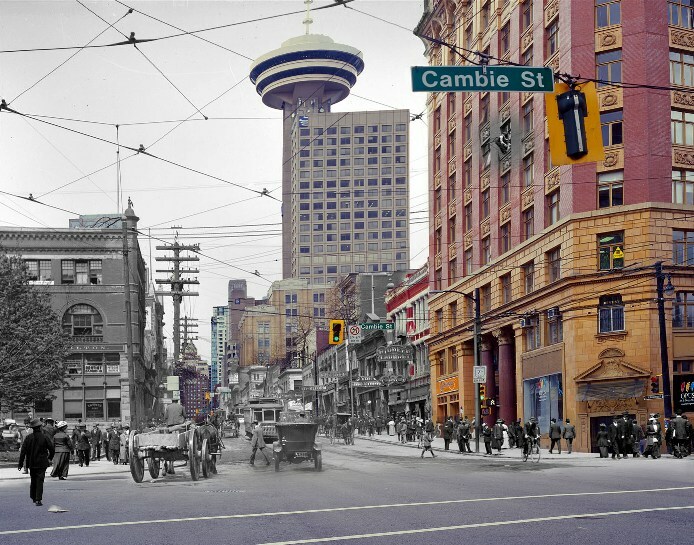 Merging Time: Vancouver Through the Lens arrives in time for the City’s 125th birthday. The artistic work of the Langara Photo 1248 class anchors the city to its past, brings back to life an era that once was, and contextualizes our surroundings into a time that will always be. The exhibit provokes discussion about change, remnants and progress. 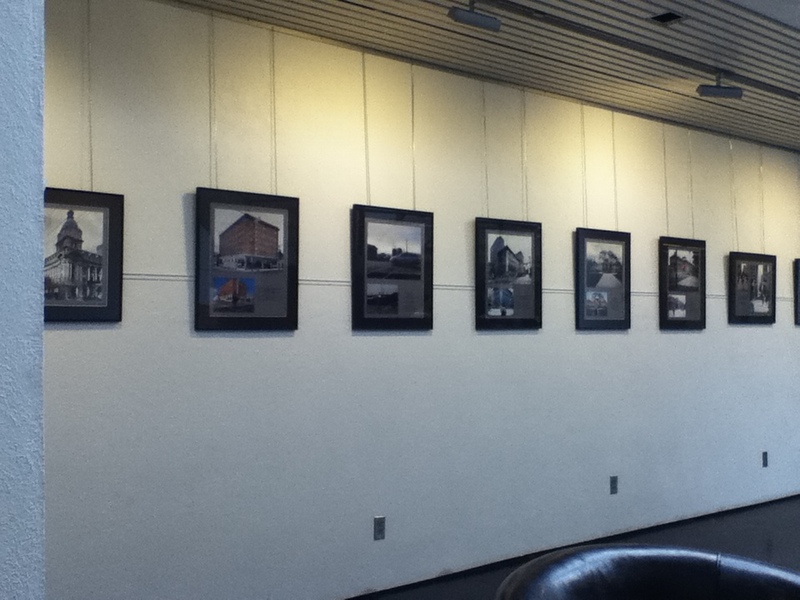 This exhibit will be on display until 12 PM, Friday, December 23rd. If you cannot attend the exhibit in person, you may also view the pieces online. 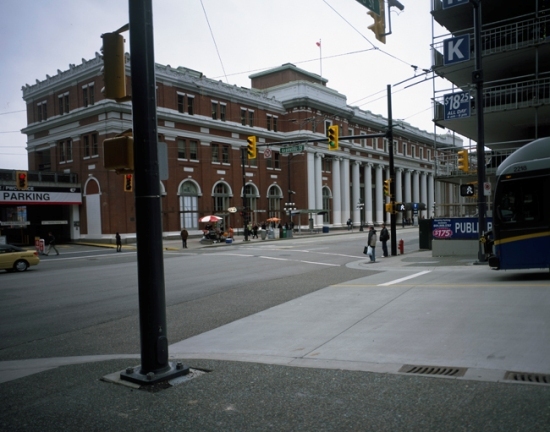 This entry was posted in General, Public Programming and tagged Historypin, photographs, Vancouver. Bookmark the permalink. Thanks for bringing to my attention this exciting exhibition, project, and History Pin.